On the stock R3D fan setup layer cooling is always on. With your current setup it is now optional and off. This would explain the differences you are seeing. BTW layer cooling with ABS can be beneficial, in other words, always off is not always correct. #2 the shape and total height of an E3D nozzle is different than the pointy long cone tip of a Raise3D nozzle. #3 the E3D tip also has a flat land to it around the nozzle to smooth the layer. Based on what you replied, the think the reported temp is accurate, you are just now seeing better heat conduction to the filament and different results of the nozzle and other details. (theoretically) benefit from layer cooling, I've just never been in a position where it was necessary before. Well then im at a loss to explain the difference but I do agree with Jetguy that the hotend is probably not running hotter then requested. The photo shows a part that didn't have time to cool down between layers not necessarily extruded too hot to start with. turn on the berd and see what happens. That does all make sense. I suppose I'll just need to dial in all my settings and such again to account for that. All in all this upgrade seems to have alleviated the issue with heat creep I was having with the stock hot end, so I'm happy. The next step is getting the Berd Air set-up working and hopefully it'll all tie in to a fully functional machine! FWIW, I noticed a difference switching to copper nozzles VS original brass, and I think that is a major piece of why I saw such an amazing rate with flexible filament. So it doesn't surprise me entirely to see using ABS with higher heater temps you might normally use with less conductive nozzles, and you also run a new copper heater block- yes, i would say lower "required" extrusion temps is a benefit of this setup. trae@greenlee.cc wrote: Well then im at a loss to explain the difference but I do agree with Jetguy that the hotend is probably not running hotter then requested. Yeah, it seems I'm just going to be experimenting with settings and various setups until I get it dialed in with the new rig. Thanks for the advice. Is there a ready to install firmware file modified to run the berd-air from the HE2 port? SteveWallin wrote: Is there a ready to install firmware file modified to run the berd-air from the HE2 port? scroll up a bit, jetguy discussed how to modify the source to run the HE2 port. I'm not aware of one pre-compiled for this. There were/maybe still are some drawbacks running custom code on the motion board in how it functions with the touch interface. Maybe someone who keeps up with this can chime in as i dont use the touch interface and dont follow issues related to it. all metal hotends are great for high temp materials but sometimes can be a PIA with PLA. 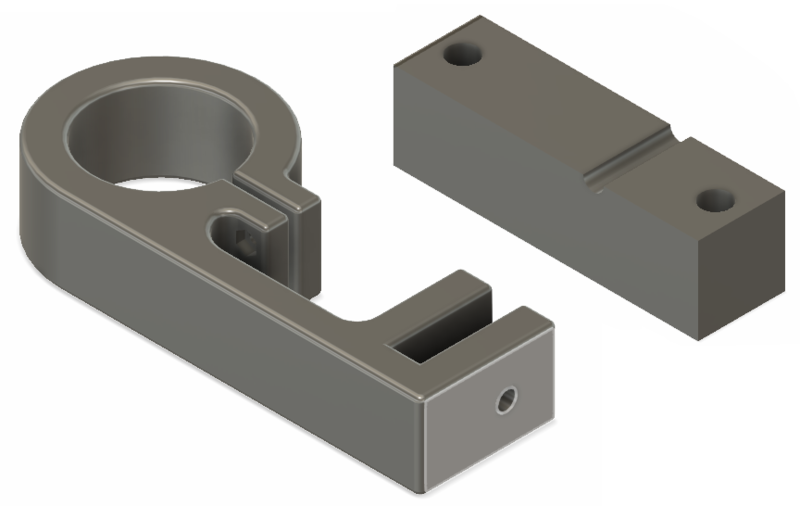 What if there was a hotend that can run up to 280c (maybe more) yet still have the nylon liner in the area jams tend to occur? How about a hybrid heat break. This heat break keeps the hot zone all metal and lines the cold area with nylon. still very beta but its been working well with the test iv'e thrown at it. Last edited by trae@greenlee.cc on Sun Nov 18, 2018 1:18 am, edited 1 time in total. some shots of the temperature testing i did to see what the temperature was where the Nylon meets the heat break. Made up some mounts to attach the berd air. 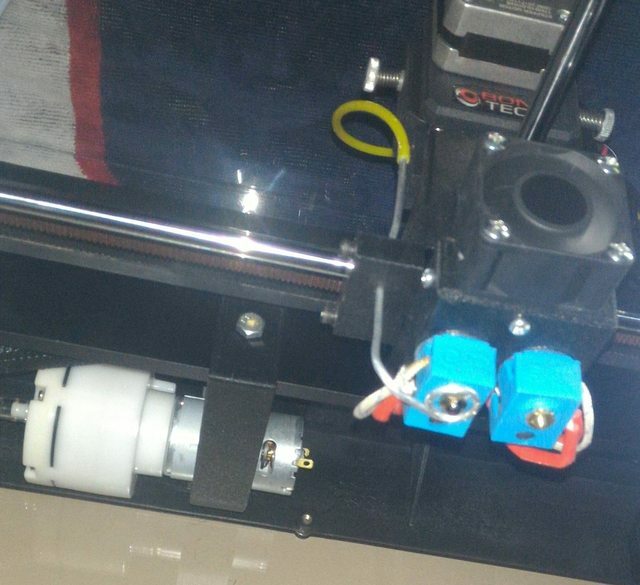 The pump mount bolts through the hole in the center back of the printer and clamps to the rail. I'm using this front fan mount with it. I haven't been doing much printing lately and haven't finished installing my upgrades for the berd air pump yet. I picked up some esun elastic filament. I've been able to print with it just by slowing the speed down to 15m/s max. I was having some problems with my computer so I did a clean install on windows 10. So now I have had to upgrade to the latest version of ideamaker. What is the opinion of the latest touch screen firmware? has it broken any of the marlin controller firmware? I'm not sure what i want to do if i have to update the firmware in my printer as I haven't had a need to change or play with it in a while. Using E3D hot end on N2 with BondTech extruder. I'm reading a temperature difference of 24% at any temp between my set temp and the temp I read with a K-2 thermocouple meter. So at a set temp of 215C I get a display temp of 215C but a meter read of 190C. I'm placing the probe behind the silicone boot on the copper E3D block and next to the thermocouple. Btw, I got onto doing this because I could no longer print PLA+ at 190C. I had done some temperature printing tests and found 185C to be optimal and increased it to 190 to account for temp fluctuations while printing. I have done many hours of printing before this problem arose. I started checking the actual measured temp of the block and nozzle and found that it was way way below the reported temp. I figured I must have a bad connection somewhere and proceeded to look, but could not find it. I re-did all the screw downs and ensured each plugs were secure all the way back to the motion board. I then I replaced the daughter board, but that did not help either. The thermocouple has shrink wrap at the connector end to stop fraying and protect against shorting. 3) Temperature of the hot end ascends smoothly with solid green light until within 10% of terminal temp and then the light flashes. At the set temp the temperature will fluctuate a degree up or down. 4) The difference is 24% at any temperature measured by direct measurement at spot temps. 5) I replaced the daughter board just in case it has a bad amplifier. 6) I've made sure the heat and thermocouple cartridges are securely seated. 8) Although it is doubtful that the thermocouple is bad, I've ordered a new one as I didn't have an extra and I should. So I can stick that in and see if I get a change. I can also test the resistance between the two to see if they are different. Except for "8)", I'm out of ideas of what to check next. Has anyone got any ideas of things I should be checking and have not? Are you getting PLA jams where the filament stops moving and requires removing the filament from the print head and reloading? If this is the case is there 10 or so mm of swelled plastic at the end of filament? Try connecting the thermocouple cartridge to your meter, and your additional thermocouple to the printer. They're both type K. See if the difference is still there or reverses. Thanks for the responses. I don't yet have an extra cartridge, but when I do I will check with a meter. Since I wrote the above, things got worse. The hot end is now reporting no rise in temperature even when very hot. So maybe it is a bad thermocouple or amplifier. No time to check until Sunday or Monday. And, yes I was getting jams with the 10mm or so of swelled plastic. Twice I had to take it all apart. I've taken it apart and back together so many times I suspect that something has gotten damaged just from all the tinkering. But I built an entirely new print carriage and printhead body to lighten the moving parts by about 49% less than even a single BondTech BMG. (I set out to do this to eliminate the small amount of bearing play in the stock extruder print head. Mission accomplished.) So, I've had to tinker a lot. My entire moving carriage (rods and bearings included) weighs in at 473 g vs. stock of 1119g and BondTech of 919g. Because of the heating problem I have not been able to tune the system to see what it will do -- or even if it will do better. So far, I do know I can set acceleration using 3000 for printing and travel at 4000 with 200mm/sec speed. No skipped steps but I am running the SD2224 stepper on the X & Y. I've kept the jerk low at 12 but tried it as high a 30 with no obvious detriment. I had not been able to get the filament to flow fast enough to keep up with the speed of the print head. I'm hoping whatever heating problem I am having is related to that problem. My line of though was that maybe the heatbreak wasn't tight in the heatsink causing thermal creep and jams. Also poor cooling fan performance can cause the same result. at first the temp difference wasn't that out of line due to the way and where the two probes are mounted to the heat block. One other thing you can check, the IC in the too head that measures the thermocouple and sends the signal back to the motion board will put out a proportional voltage relative to the temperature measured. eg you can measure the temp with a volt meter on the output pins of the IC. I forget which IC was used but its here in the forums in one of jetguys post.